Congratulations! You’ve just been promoted to head a new business unit. You and your new leadership team have been tasked with solving a challenging problem that is critical to the company’s continued success. Naturally, you aren’t given a lot of time to create a turnaround plan. Your mission is clear: Lead your team to efficiently, innovatively and quickly develop a solution. And as your CEO told you, only half kiddingly, failure is not an option. Before you can delve into the project with your team, it’s essential to determine what stage of development your team is in. Although it’s tempting to dig in and try to work on the problem immediately, unless your team is at a stage of development where it can be productive, your progress will be slow, misdirected and frustrating. In 1965, psychologist Bruce Tuckman described the stages every team must go through as it matures. These stages hold true today; if you can accurately assess the stage your team is in, you can guide members more quickly to a highly productive stage. 1. Forming: This usually occurs when the team has been newly formed; however, it can still occur with teams that have been together for years. Members may be excited or nervous about the project and about each other. They may be carefully polite and concerned with how they are perceived by others on the team. They are more likely to tell their own stories without listening deeply to stories of others. Although team members may pat themselves on the back about how well they all get along, they are not willing to challenge the status quo or suggest bold ideas. 2. Storming: The group grows more familiar with each other and may jockey for power positions, especially if roles are not clearly defined. Team members don’t trust each other or their motives. Decisions aren’t easily made and the energy is negative — filled with frustration. Surprisingly, this uncomfortable stage is necessary for any team’s development. It’s here the polite veneer drops and members think a little more objectively, paying more attention to others’ ideas. However, this is also a stage where, without intervention, teams can get stuck. 3. Norming: When the team realizes the storming phase is not effective and that the group goal is more important than individual concerns, members settle and the team starts to normalize. They begin to rely on each other for advice and may even begin socializing. They work more synergistically, increasingly listening to each other’s ideas. Although they may still hit a roadblock, the trust they have developed allows them to refocus. 4. High-performing: Beyond norming, a high-performing team is highly coherent, with all members contributing. The team has a deep understanding of its purpose and that they are all working together for a common goal. They realize they can accomplish more together than apart. Because they see the overall goal, they are more likely to listen empathetically, in search of making a difference in the larger system. Sure, you’d love to inherit an already high-performing team for your new — or for any — project, but chances are, you’ll have to help your team develop. Here are a few tips to move your team forward. If you don’t see enough diversity, create it. Even if your team is already established, member additions and deletions can energize and refocus a group. 3. Most importantly, recognize the role that you have in advancing your team to the high-performance stage. As the leader, you set the tone for how the team will progress. If you’re not comfortable challenging your team to be great, you may get stuck in the first stage of civility. If you have a command and control style of management, you may discourage trust, communication, and innovation, extending the forming and storming stages. And, if you don’t believe in the strength of your team, you may not be able to clearly share your vision for all they can accomplish. 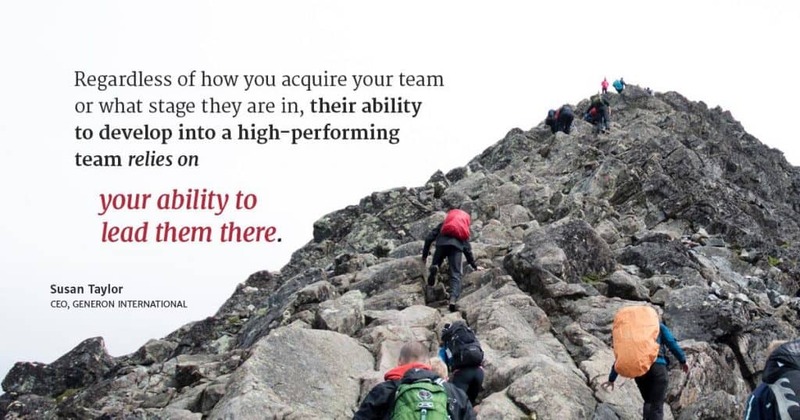 Regardless of how you acquire your team, or what stage they are in, their ability to develop into a high-performing team relies on your ability to lead them there.